After Becky Bayne’s father died, she and her husband Jay had to take apart his house and go through his things. It was a long, painful process. As the couple worked, they thought about how much they didn’t want to leave their two sons with the same task when they passed on. “We aren’t retiring yet or anything, but we are taking a step back to make our lives easier,” Becky said. Fast forward to a vacation the couple took to Florida where Becky and Jay stayed in a 400–square–foot cottage. They talked about how they wanted to downsize. Finding themselves comfortable in the smaller space, they decided to research tiny houses on the Internet when they got back. They ended up buying their home (a basic shell) from Tumbleweed Tiny House Company. It arrived on Christmas Eve of last year and was delivered to a storage space where the couple has worked on it. Jay said they contracted out some of the interior work, such as the plumbing and electrical, and then some of the work they have been doing themselves, constructing stairways and installing cabinets and counters. The main floor is 157.87 square feet. When the two above-the-head lofts are added, the house tops out at 269.06 square feet. Actually, Becky said the price per square foot is generally more expensive than for a regular-sized house. In reality, contractors work in tighter spaces, which are more difficult. They must find room for all the wires, boxes, etc. Jay said if you have a full-time job and little to no knowledge of carpentry, plumbing or electrical work, it can take years to finish and you could end up in over your head. Jay and Becky had professionals do the work that could be considered dangerous. 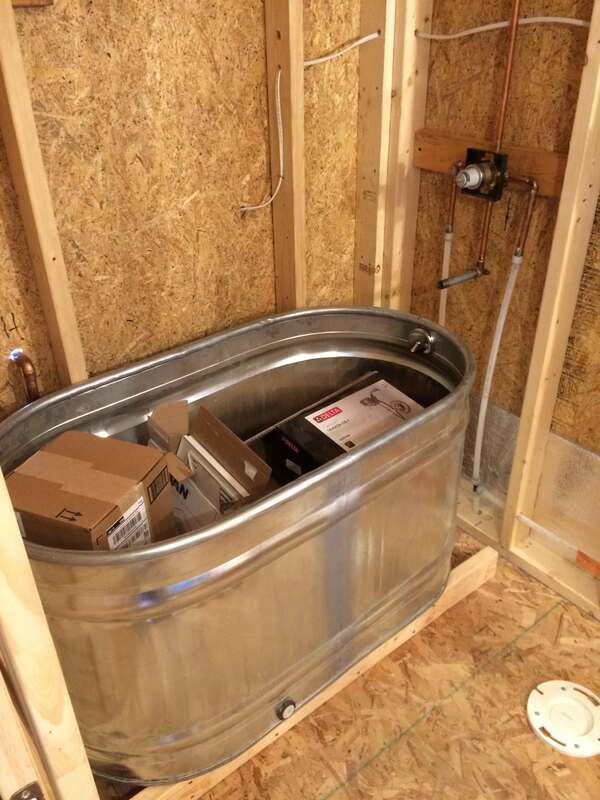 The electrical and plumbing were done according to code for safety. “That way, no matter where we take the house, we can show the landowners or whoever is selling us land that the plumbing and electrical were done safely by professionals, that it’s a solid structure,” Becky said. How was working with Eyman? “Very good,” said Jay. Someone advised the couple to go to one of the professionals and see if they would be interested in working on a tiny house. There were those contractors who didn’t want to take part because the codes in Arizona are different than in Omaha. But when Becky called Eyman and asked if they were interested, they were. Terry called her back and came out, did a walkthrough of the space and prepared an estimate. Becky said Tim and another Eyman employee worked on the plumbing for a bit more than a week and got everything done. Jay and Becky will move to Arizona in the next few weeks. A professional driver was hired to move their tiny house to a storage unit there. The couple will locate their tiny house at an RV park until they find a piece of Arizona land that suits them. Becky said she’s still in the process of downsizing, but makes progress every day. “It’s not easy but it sure is worth it,” she said. To follow the Baynes’ progress, you can check out Jay’s blog here.